English teacher Molly Vasich has always been curious about class participation—what prompts it and what discourages it? Teaching upper-level International Baccalaureate courses to predominantly white students at Washburn High School in Minneapolis, Vasich was particularly aware of the class participation patterns among her few students of color. For some, engagement spiked during units on African-American or Latino literature, but for others it plummeted. When Vasich surveyed the students, she discovered that some were relieved to see their personal experiences reflected in the texts but that others zoned out during those units because they felt uncomfortable when white students explained or misinterpreted the works. Last year, Vasich who is also a teacher consultant with the Minnesota Writing Project, set out to develop a course that not only highlighted authors of color, but also allowed students of color to share their thoughts and experiences and hone their own creative voices. Her new course, Black Voices, has a syllabus stacked with contemporary African-American literature and media. An LRNG Innovation Challenge grant allowed her to turn the class into an even more engaging experience for her students. A student performs an original poem at the Guthrie Theater. The LRNG grants stem from a partnership between the National Writing Project and John Legend’s Show Me Campaign to help educators extend time and space for connected learning. The connected learning theory posits that learning happens on a continuum—in school, as well as at home, work, and among friends—and is driven by students’ own interests and life experiences. 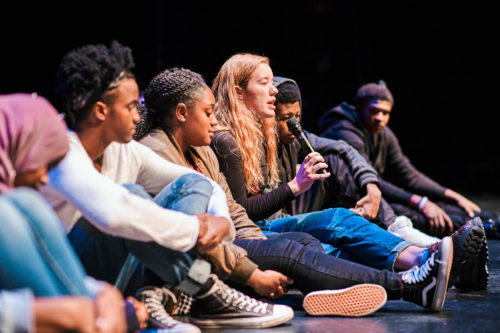 In addition to analyzing published work, Black Voices students write and perform their own pieces, with guidance from professional spoken word artists. Twice a week, educators from the nonprofit arts and culture organization TruArtSpeaks teach the course alongside Vasich. TruArtSpeaks works to cultivate literacy, leadership, and social justice through the study and application of spoken word and hip-hop culture. Throughout the semester, the experience of people of color is “prioritized,” Vasich said, rather than being relegated to a unit in a broader literature class. The new course, which drew more students of color than Vasich’s other classes, delves into systemic racism, intersectionality (the interconnected nature of social and racial classifications), and resistance. The students study Ta-Nehisi Coates, James Baldwin, Michelle Alexander, and Octavia Butler, along with a variety of other media, from critical theory and podcasts to Beyoncé’s “Lemonade.” Vasich wants her students to see that issues of race and identity permeate culture, in many contexts, and that a critical lens comes in handy beyond classroom literary analysis. “I want them to be able to transfer these skills to their everyday lives,” she said. However, it is important to Vasich that the students not only consume the texts and media, but create their own work simultaneously. “Reading texts from authors of color at the same time as producing your own texts allows you to see value in what you have to say too,” she said, not just what others say about you or your work. This semester, spoken word artist Keno Evol is the class poet-in-residence. Vasich has seen the progress the students are making in his poetry workshops. At the beginning of the semester, students tended to produce pieces that made statements about society, said Vasich, but with time they’ve become comfortable writing personal pieces. “We charge young people to navigate through and articulate their identity by way of poetics,’ Evol said. At the end of the semester, the students will perform their work at a public showcase, and through TruArtSpeaks have the opportunity to perform at various youth poetry slams throughout the state. They also take field trips to meet working artists and writers. Recently, the students went to see “The Parchman Hour,” a play about the 1961 Freedom Riders at the Guthrie Theater. The following day, the actors visited the Black Voices class to discuss the show. 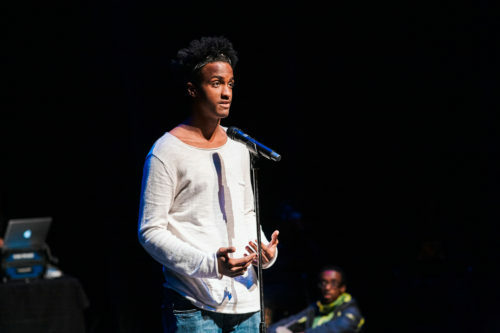 The students then wrote poems responding to the play, on topics including activism and policy brutality, which they performed at the Guthrie as part of a TruArtSpeaks showcase. Vasich hopes the variety of experiences in the class help engage students who have historically been unmotivated to participate, or who complete assignments simply to make the grade. The team-taught class also allows the students to develop relationships with adults who are not their primary teachers, but may have more in common with the students. “I don’t believe I’m an authority on [black literature],” said Vasich, who is white. Early on, Vasich was upfront with students about her limitations and expertise. She even showed a MADTV sketch spoofing the trope of the white female teacher who parachutes into an inner-city classroom and inspires the students. “It helps set the stage for them to feel comfortable making comments about our race or our gender or our background, and to talk honestly about what’s happening,” Vasich said. Collaborating with out-of-school educators and artists has also opened the English teacher’s mind to new perspectives on learning. “I feel like I’m taking notes in class every day,” she said.